President Trump has inadvertently thrown a wrench into the final stage of Army sergeant Bowe Bergdahl’s trial. Bergdahl, who left his post in Afghanistan in 2009 and was subsequently captured and held captive for years by the Taliban, pleaded guilty last week to desertion and misbehavior before the enemy. 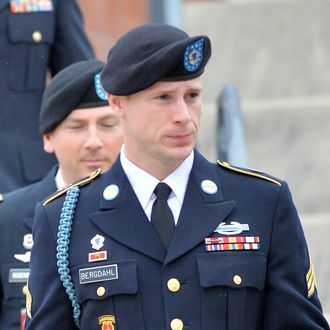 His sentencing was delayed on Monday as the military judge presiding over the case, Colonel Jeffery A. Nance, listened to the defense argue that Trump’s recent statements about Bergdahl had prevented him from getting a fair hearing. Bergdahl faces a maximum sentence of life in prison. While running for president, Trump called Bergdahl “a dirty rotten traitor” and repeatedly said that he should be executed. Nance had previously ruled that Trump’s comments did not constitute unlawful command influence because they were made before he was elected. But on October 16, the president spoke about Bergdahl again. When asked about the case, Trump said that he couldn’t discuss it, “But I think people have heard my comments in the past.” As commander-in-chief of the military, Trump is now Nance’s boss. “Words have meaning. And ‘but’ means what?” Nance asked prosecutor Maj. Justin Oshana, who disputed [defense attorney Eugene Fidell’s] assertion that Trump continues to hold such views about Bergdahl. Pressed further on Trump’s verbiage, Oshana offered that the president’s words were “not the best constructed,” a statement that elicited stifled chuckles in the courtroom. Bergdahl’s lawyers have asked Nance to dismiss the case over Trump’s involvement. He might not rule on that until next week.